Bryce Reece scored five goals for Lenape in a win over Washington Township. Lenape scored the game-winning run in the bottom of the ninth inning to beat Timber Creek, 2-1, on Friday in Olympic Conference baseball action. Bryan Feldman and Kyle Mulville limited Timber Creek to two hits. Mulville didn’t allow a walk, conceded just one hit in 3 2/3 innings of relief and struck out four hitters to earn the win. Nick Garagozzo and Shane Reilley drove in Lenape’s runs. Stephen Przychowicz’s RBI single in the bottom of the sixth inning drove in the only run in Pennsauken’s 1-0 win over Rancocas Valley in Burlington County League action. Anthony Rullo scored the game-winning run and earned the win for Pennsauken. Bryce Mangene struck out 11 batters in six innings for Rancocas Valley. Marquice Thornton had a double, triple and three RBIs for Westampton Tech to help it beat Medford Tech, 12-2. Jordan Olaff also drove in three runs for the Panthers. Absegami scored six runs in the top of the sixth inning to break a tie game and beat Oakcrest, 11-8, in Cape-Atlantic League action. Sam Muniz had a double, a triple and four RBIs for Absegami. Billy Wheatley went 3-for-3 with a double and an RBI for the Braves. In other Cape-Atlantic League action, Brody Levin hit a grand slam during Mainland’s 12-run third inning in its 15-1 win over Middle Township. Devin Sharkey had a double, triple and three RBIs for the Mustangs. CJ Brown and Clayton Sands each had two hits for Mainland. Kingsway defeated Williamstown, 6-0, in Tri-County Conference action. Sean and Justin Szestowicki each hit home runs for the Dragons. LEAP Academy beat Pennsauken Tech, 13-3. Maclein Reyes struck out nine hitters in five innings to earn the win and went 2-for-3 with a double and RBI at the plate. Victor Perez went 4-for-4 with a double and two RBIs for the Lancers. Caesar Salcedo hit a home run and drove in two runs for LEAP Academy. Doane Academy defeated Atlantic Christian, 12-4. Zachariah Bhuiyan hit two doubles and drove in four runs. Jayson O’Connell hit a home run and had two RBIs. Ryan Halasa allowed three earned runs and struck out 10 hitters in a complete game. RJ Moten went 3-for-4 with a double, home run and four RBIs in Delran’s 11-1 win over Haddon Heights. The Bears scored seven runs in the first inning. Alex Madera went 2-for-3 with a double, triple and an RBI. Jake Baumann recorded hits in all three of his at-bats and had an RBI. Bishop Eustace came back from a one-goal halftime deficit to beat Holy Cross, 9-8. Rachael Cardone scored a hat trick, while Madison Matt, Veronika O’Donnell and Abby Romani each scored twice for the Crusaders. Ava Taylor led Holy Cross with three goals. Moorestown Friends scored 10 first-half goals to beat Abington Friends 15-3 in Friends Schools League action. Meghan Roberts and Bella Runyan each scored five goals for the Foxes. Madison Bouggess also had a multi-goal game with two goals. Burlington City shutout Maple Shade, 13-0. Raniya Bruton-Moore led the Blue Devils with five goals. Rexney Thenor netted a hat trick for Burlington City. Our Lady of Mercy shutout Cedar Creek in the second half of its 11-3 win in Cape-Atlantic League action. Mary Meduri led all scorers with six goals. Anissa Serafine scored three times for the Villagers. Maple Shade defeated Burlington City, 21-11, in Burlington County League action. Melissa Donaldson went 5-for-6 with a double and seven RBIs for the Wildcats. Morgan Hart also had seven RBIs for Maple Shade. Alicia Smith went 2-for-4 with a triple and four RBIs. Washington Township beat Lenape, 13-10, in eight innings in an Olympic Conference matchup. Morgan Fitzpatrick had four hits and scored four runs for the Minutemaids. In other Olympic Conference action, Cherry Hill West beat Timber Creek, 15-1. Meghan Davis homered twice, and Rachel Kubrak also hit a home run. Isabella Sylvester drove in three runs for the Lions. Kendal Bryant went 2-for-2 with three RBIs as Buena beat Holy Spirit, 11-1, in a Cape-Atlantic League matchup. Bridgette Gilliano went 2-for-3 with a home run, and Gabby D’Ottavio had two hits, including a triple. Mary Jane Calascione pitched a complete-game shutout and drove in a run in Hammonton’s 4-0 win over Vineland. Calascione walked just one batter. Cayla Kalani went 2-for-4 with an RBI, and Haley Weinberger had two RBIs for the Blue Devils. Lenape beat Washington Township, 15-4, in Olympic Conference play. Mason Bregman had an eight-point game with six goals and two assists. 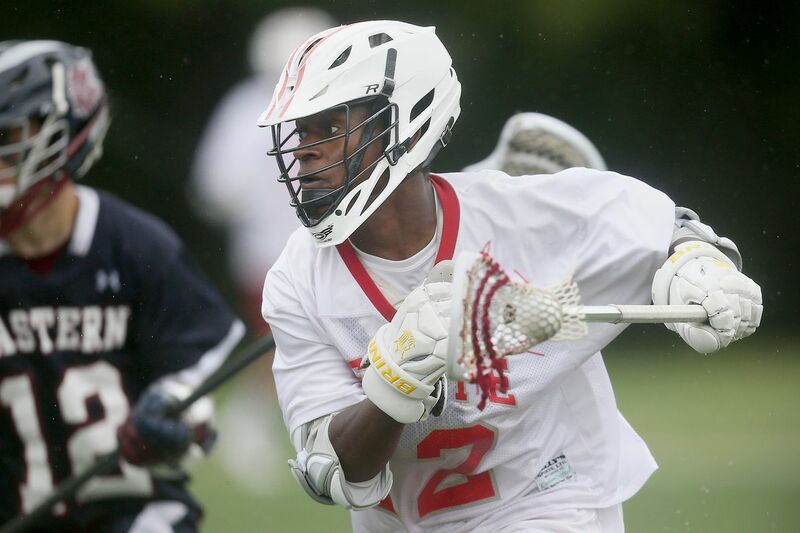 Bryce Reece scored five goals for Lenape. Matt Soutar scooped up 14 ground balls and lost just one of the 18 face-offs he took. In other Olympic Conference action, Williamstown beat Winslow Township, 14-1. Bryce Monahan and Michael Trimble each scored hat tricks. Trimble also set up his teammates with six assists. Colin Cooke scored six goals in Mainland’s 21-6 win over Oakcrest in Cape-Atlantic League action. Dominic Gagliardi scored four goals, and Brandon Batz tallied a hat trick.